^ 1.0 1.1 1960 Hurricane Season Open As Planes Prowl. The Evening Independent (Jacksonville, Florida). Associated Press. 1960-06-15 [2015-07-23]. ^ 2.0 2.1 Hurricane Hunters Go Away Till The Next Time. The Miami News. 1960-11-15 [2015-07-23]. ^ 3.00 3.01 3.02 3.03 3.04 3.05 3.06 3.07 3.08 3.09 3.10 3.11 3.12 3.13 3.14 3.15 3.16 3.17 Gordon E. Dunn. The Hurricane Season of 1960 (PDF). United States Weather Bureau; Atlantic Oceanographic and Meteorological Laboratory (National Oceanic and Atmospheric Administration). 1961-03 [2015-07-23]. （原始内容存档 (PDF)于2013-11-26）. ^ Edward N. Rappaport, Jose Fernandez-Partagas, and Jack L. Beven. 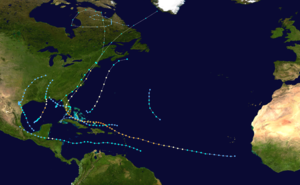 The Deadliest Atlantic Tropical Cyclones, 1492–1996. National Hurricane Center (National Oceanic and Atmospheric Administration). 1997-04-22 [2015-07-23]. （原始内容存档于2015-07-17）. ^ Arnold L. Sugg. The Hurricane Season Of 1965 (PDF). United States Weather Bureau (Miami, Florida: National Oceanic and Atmospheric Administration; National Hurricane Center). 1966-03 [2015-07-23]. （原始内容存档 (PDF)于2013-10-22）. ^ Atlantic basin Comparison of Original and Revised HURDAT. Hurricane Research Division; Atlantic Oceanographic and Meteorological Laboratory (National Oceanic and Atmospheric Administration). 2011-03 [2015-07-23]. （原始内容存档于2015-07-05）. ^ 8.0 8.1 David M. Roth. Unnamed Tropical Storm – June 22–29, 1960. College Park, Maryland: Weather Prediction Center. 2007-03-12 [2015-07-23]. （原始内容存档于2014-07-21）. ^ AOE Report – Closed Highways (GIF). United States Weather Bureau (National Hurricane Center; National Oceanic and Atmospheric Administration). 1960-06-26 [2015-07-23]. （原始内容存档于2012-03-02）. ^ Roth, David M; Weather Prediction Center. Maximum Rainfall caused by Tropical Cyclones and their Remnants Per State (1950–2012). Tropical Cyclone Point Maxima. United States National Oceanic and Atmospheric Administration's National Weather Service. 2013-01-07 [2015-07-23]. （原始内容存档于2013-05-23）. ^ Hurricane Abby Preliminary Report (GIF). United States Weather Bureau (Miami, Florida: National Oceanic and Atmospheric Administration; National Hurricane Center). 1960: 2 [2015-07-23]. （原始内容存档于2012-10-24）. ^ Abby Breaking Up In Honduras. Ocala Star-Banner. Associated Press. 1960-07-15: 4 [2015-07-23]. ^ Richard D. Geppert. Hurricane Abby. United States Weather Bureau (Miami, Florida: National Hurricane Center; National Oceanic and Atmospheric Administration). 1960-08-03 [2015-07-23]. （原始内容存档于2013-10-29）. ^ 15.00 15.01 15.02 15.03 15.04 15.05 15.06 15.07 15.08 15.09 15.10 15.11 15.12 National Hurricane Center; Hurricane Research Division. Atlantic hurricane best track (HURDAT version 2). United States National Oceanic and Atmospheric Administration. 2015-05-07 [2015-07-23]. （原始内容存档于2015-05-10）. ^ Carlson. Local Statement on Tropical Storm Brenda (GIF). United States Weather Bureau Office Hillsgrove, Rhode Island (National Hurricane Center; National Oceanic and Atmospheric Administration). 1960-07-30 [2015-07-23]. （原始内容存档于2012-10-23）. ^ 17.0 17.1 Keith Butson. Report on incipient tropical storm Brenda, July 28–29, 1960 (GIF). United States Weather Bureau (National Hurricane Center; National Oceanic and Atmospheric Administration). 1960-08-11 [2015-07-23]. （原始内容存档于2013-09-21）. ^ Roth, David M; Hydrometeorological Prediction Center. Tropical Cyclone Rainfall in the Southeastern United States. Tropical Cyclone Rainfall Point Maxima. United States National Oceanic and Atmospheric Administration's National Weather Service. [2015-07-23]. （原始内容存档于2015-02-10）. ^ 19.0 19.1 Preliminary Report on Hurricane Cleo, August 18–20, 1960. United States Weather Bureau (Miami, Florida: National Hurricane Center; National Oceanic and Atmospheric Administration): 1. [2015-07-23]. （原始内容存档于2015-07-23）. ^ Davis. Miami Weather Bureau Bulletin. United States Weather Bureau (Miami, Florida: National Hurricane Center; National Oceanic and Atmospheric Administration). 1960-08-18: 3 [2015-07-23]. （原始内容存档于2015-07-23）. ^ Late Twentieth Century. National Oceanic and Atmospheric Administration (College Park, Maryland: Weather Prediction Center). 2007-03-01 [2015-07-23]. （原始内容存档于2014-11-08）. ^ 1. Category A – Flood Report NR 2.2 A. Telephone Reports. United States Weather Bureau (National Hurricane Center; National Oceanic and Atmospheric Administration). 1960: 1 [2015-07-23]. （原始内容存档于2015-02-27）. ^ Hurricane Donna – September 3–13, 1960. United States Weather Bureau (Miami, Florida: National Hurricane Center; National Oceanic and Atmospheric Administration). 1960-09-27: 2 [2015-07-23]. （原始内容存档于2015-02-27）. ^ 24.0 24.1 24.2 24.3 Storm Data and Unusual Weather Phenomena: September 1960 (PDF). National Climatic Data Center (Asheville, North Carolina: National Oceanic and Atmospheric Administration). 1960: 111–115 [2013-05-09]. （原始内容 (PDF)存档于2013-05-09）. ^ Hurricane Ethel Preliminary Report (PDF). United States Weather Bureau (National Hurricane Center; National Oceanic and Atmospheric Administration). 1960-12-27 [2015-07-24]. （原始内容存档 (PDF)于2012-06-04）. ^ Robert A. Morton. Historical Changes in the Mississippi-Alabama Barrier Islands and the Roles of Extreme Storms, Sea Level, and Human Activities (PDF). United States Geological Survey. 2007 [May 23, 2010]. （原始内容存档 (PDF)于2014-10-05）. ^ Hurricane Ethel rips coast of Mississippi. The Bulletin. United Press International. 1960-09-15: 1. ^ 28.0 28.1 David M. Roth. 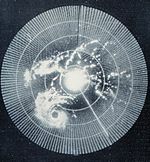 Hurricane Ethel – September 14–17, 1960. Weather Prediction Center (National Oceanic and Atmospheric Administration). 2009-10-05 [2015-07-24]. （原始内容存档于2014-12-20）. ^ Ethel. St. Petersburg Times. Associated Press. 1960-09-16: 2 [2015-07-23]. ^ Ethel Hits 3 Coastal Cities, Then Fades Out Over Land. St. Petersburg Times (Mobile, Alabama). Associated Press. 1960-09-16: 1 [2015-07-23]. ^ Cleanup slowed in wake of Hurricane Ethel. The Bulletin (Pascagoula, Mississippi). United Press International. 1960-09-16: 6 [2015-07-23]. ^ 32.0 32.1 Gilbert B. Clark. Miami Weather Bureau Bulletin (GIF). United States Weather Bureau Office Miami, Florida. Miami, Florida: National Oceanic and Atmospheric Administration; National Hurricane Center. 1960-09-24 [2015-07-24]. （原始内容存档于2015-07-24）. ^ David M. Roth. Tropical Storm Florence – September 19–27, 1960. Weather Prediction Center (College Park, Maryland: National Oceanic and Atmospheric Administration). 2009-12-20 [2015-07-24]. ^ Gilbert P. Clark. Miami Weather Bureau Bulletin (GIF). United States Weather Bureau Office Miami, Florida (Miami, Florida: National Oceanic and Atmospheric Administration; National Hurricane Center). 1960-09-23 [2015-07-24]. ^ Name a Hurricane After Me, Woman Asks Weather Bureau. The Milwaukee Journal (Washington, D.C.). 1960-07-23: 12 [2015-07-23]. ^ Tropical Cyclone Naming History and Retired Names. National Hurricane Center (Miami, Florida: National Oceanic and Atmospheric Administration). 2013-04-11 [2015-07-23]. （原始内容存档于2015-06-30）.